Me: "Hi, my name is Stella. Nice to meet you!" Scenario #1: "Hi, my name is XYZ. Nice to meet you too!" 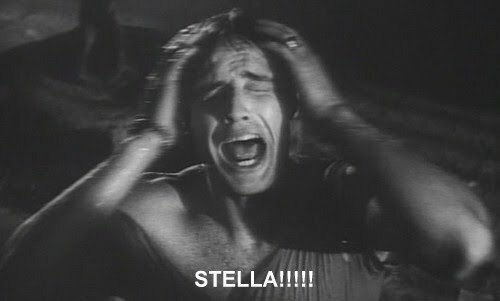 Scenario #2: "STELLAAAAAAAA!!! You know, like from SEINFELD? I bet you get that a lot." Scenario #3: "Ah, Stella! Like the BEER!" "You know, Elaine in Seinfeld was actually doing an impersonation of Stanley, played by Marlon Brando, in the play "A Streetcar Named Desire". So technically speaking the "Stellaaaa" thing did not originate from Seinfeld"
Given what my name is and Scenario #3 happening more than you know, how can I possibly turn down an invitation to the exclusive global premiere of Stella Artois’ Sensorium? It's essentially my beer after all! For $125 pp, this sold-out event consists of a five-course dining experience paired with Stella Artois and is led by Michelin-star Chef Richie Farina, former Executive Chef at Moto in Chicago, along with a team of sensorial experts who will amplify each course based on the five senses. Guests were offered a glass of Stella Artois (Twitter: @StellaArtois, Facebook: Stella Artois) to start things off. A movable wall made of Stella chalices. 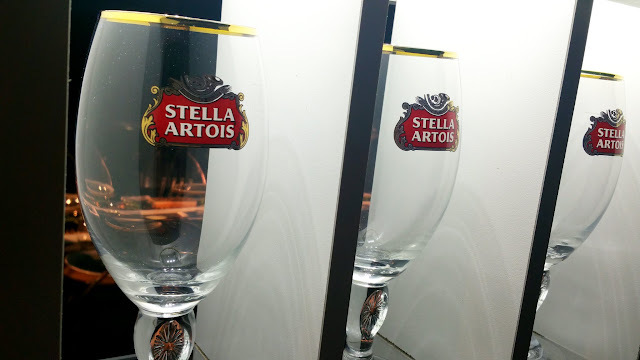 Make that two hundred Stella chalices! A garden oasis under a starry sky. Mike Bascom (far left), Marketing Director for Stella Artois, introducing the Sensorial Team. The two-year project wouldn't have been possible without these four sensorial experts. From left to right: Jamie Webster (sight), Nyles Miszczyk (sound), Dr. Irwin Adam Eydelnant (scent), and chef Richie Farina (taste). I'm ready for my first 360-degree dining experience and I'm gonna take you with me! 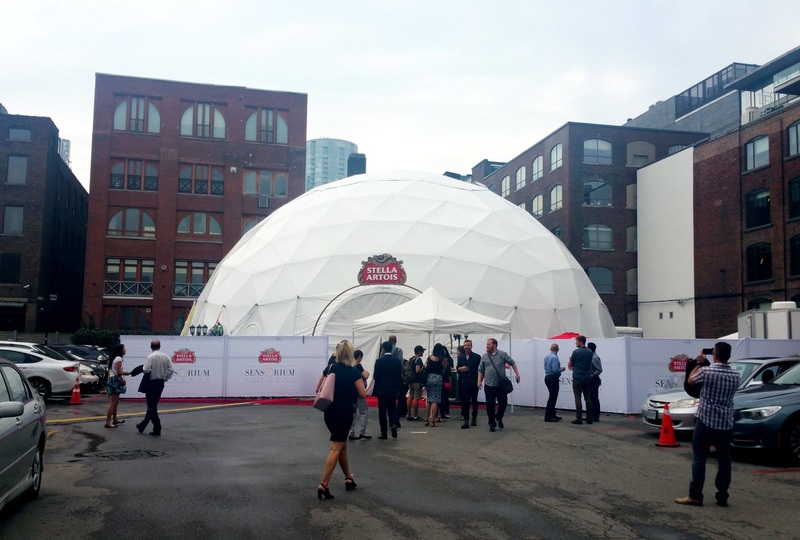 The gold circle then further transformed into a big beautiful star (FYI the Stella Artois’ Sensorium experience was created around the Stella chalice). Like I mentioned earlier the Stella Artois’ Sensorium is a multi-course, multi-sensory dining experience where each dish is inspired by one of the five senses – sight, sound, taste, touch and aroma. The experience is accompanied by video and interactive elements that engage and amplify all of the senses throughout the night. 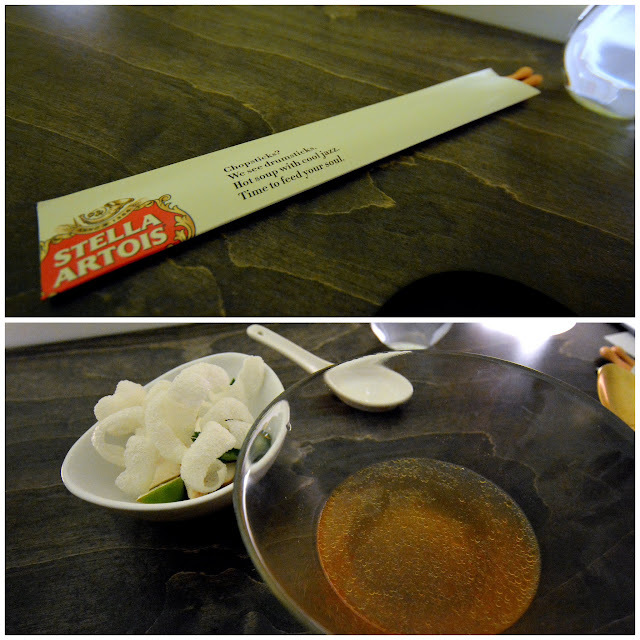 Our meal began with the inhaling of a “flavour cloud” inside a Stella chalice. Each guest's air is unique; mine reminded me of freshly baked cake. A selection of raw petite vegetables planted in mushroom soil and roasted garlic aioli. An edible garden. The most unique element in the planter for me was the distilled liquid stored in the vials; the liquid contained all the flavour profiles you would find in a Greek salad. It was very refreshing and served as a great palette cleanser. Both the sky and the music changes throughout the two-hour dining experience. This green leafy projection was during the salad course. There's only so much that photos can capture so I took a video. I hope this gives you a better idea of the atmosphere and ambiance inside the Sensorial Dome. "Sweet coconut fields, give way to the savoury sea, get ready to set sail, your journey has just begun." Notice how the sky matches the plate. Raw and dehydrated scallops, poached halibut with a young coconut puree accompanied by a variety of fresh sea vegetation. This was my favourite course. Surrounded by brine-scented dry ice, not only did I love the presentation of this dish but I also really enjoyed the thick and juicy raw scallop, which paired exceptionally well with the saltiness of the diced dehydrated scallops. A vegetable broth served with crispy rice noodles, chilies, bean sprouts and a variety of herbs. "Chopsticks? We see drumsticks. Hot soup with cool jazz. Time to feed your soul." It was so cool how the broth danced to the beat of the drum! Too bad it was too dark to see everything that was happening in my own bowl (that's why I started filming the bowl from the guest sitting beside me). Although this course had the coolest effects I have to say it was the most disappointing course in terms of flavour. The broth was a bit on the bland side, and because it was only lukewarm the mushroom, beansprouts and herbs remained raw. Braised beef cheek bird's "nest" with caramelized cauliflower puree, mushroom leaves, salsify branches, succulent greens and cauliflower soil. I loved that the smoke trapped inside the overturned glass smelled exactly like campfire! The "bird's nest", which was made of braised beef cheek, mushroom and salsify, all sat on top of cauliflower soil. The variety of textures on this plate was amazing. Chocolate ganache with graham cracker served inside a marshmallow fluff. Accompanied with a rich chocolate truffle. We roasted skewers of marshmallow over an open flame. This was interactive and a lot of fun - a great way to end the meal! Unfortunately the flame died too quickly - my marshmallow was not nearly browned enough and the chocolate ganache inside was still solid when the fire burned out. "An unexpected journey starts with an unexpected menu. This one tastes as good as it looks." 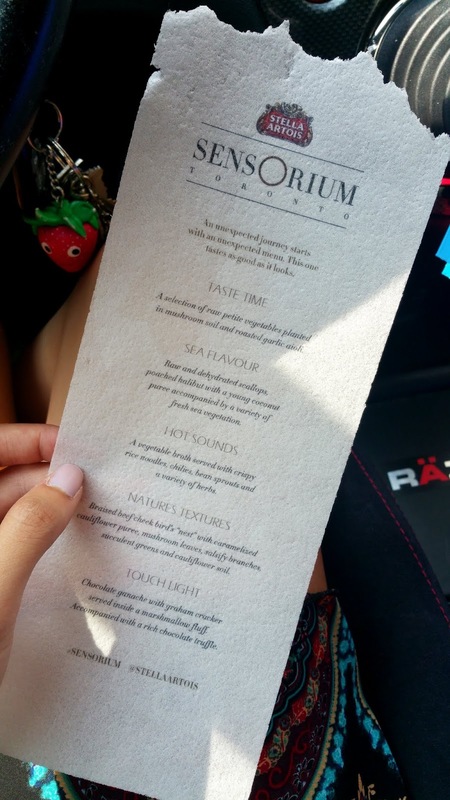 The whole Sensorium journey was unlike anything I've experienced before; in a span of two hours the multi-sensory feast woke up all my senses. It was an unreal experience, one that I'll never forget.